There is a lot of talk about metrics, measurements, and KPIs in the world of Customer Success. Peter Drucker’s statement that, “What gets measured gets improved” continues to show up in presentations and blogs, on a variety of topics from CS ROI, to Health Scores, and Voice of the Customer. How all of these numbers fit together into an overall strategy for improvement. After all, the quote is “What gets measured gets improved” not “What gets measured magically improves”. Metrics, and specifically KPIs, are an essential first step in understanding company performance, but metrics are also critical in achieving the results reflected in your KPIs. This blog is an overview of what I’ve learned about measurement and “getting improvement” over the last 20 years. It’s a bit of a deep dive into the second “gets” in Drucker’s quote, focused on how measurements all tie together to help us get results. As always, your wisdom, insights, comments, or concerns are welcome! We can all benefit from continued, in-depth discussions on these topics and more. It is difficult, if not impossible, to have a discussion about business measurements or metrics without discussing KPIs, Key Performance Indicators. Investopedia defines a KPI as “a set of quantifiable measures that a company uses to gauge its performance over time.” In this blog, we are going to discuss three types of metrics. Leading and lagging metrics (many of which are KPIs) and a third type, process performance metrics, which I consider a metric, but not necessarily a KPI because they measure the performance of a process, rather than the performance of the company as a whole. By diving in with some examples, we can better understand how to piece together a series of metrics to not only get a better picture of your business as a whole, but also to deliver results. There is a huge misconception that lagging metrics such as Revenue or Earnings are somehow “poor” KPIs. In reality, they are the most important ones. Unfortunately, when it comes to “what gets measured gets improved” they are a great starting point, but somewhat lacking in helping you to actually improve. The reason for this is the fact that they are lagging indicators. By the time you know what this year’s (or quarter’s) revenues and earnings are, it is too late to do anything about them. 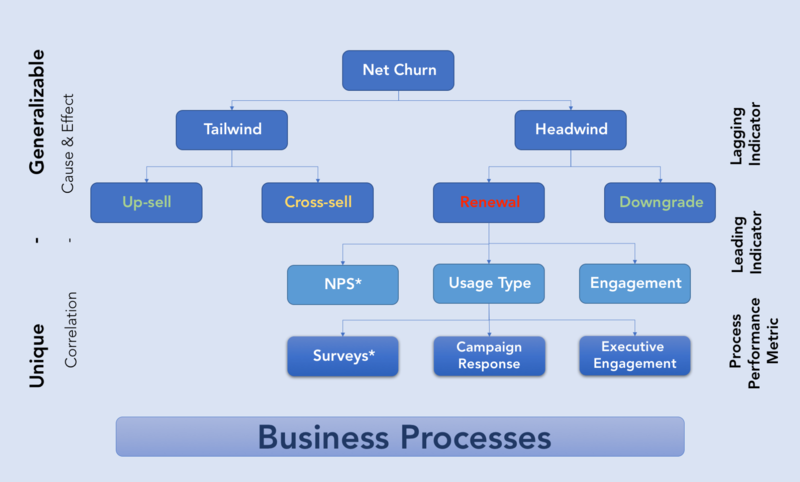 If you look at the most commonly discussed Customer Success metrics they are all actually quite useful. Strikedeck’s Customer Success Magic Numbers or Jeremy Gillespie’s suggested six including Churn, Revenue Retention, Inbound Lead Velocity and more are all great metrics that should be measured, tracked, and reported. Just recognize that they are inherently lagging. So why do we focus so much on lagging metrics versus the leading ones? Years ago, I had a colleague that made a great practical observation. She pointed out that part of the reason lagging indicators get used a lot is because they are easy to measure. We can pull them from Salesforce, or our financial systems etc. She also pointed out that although they can be easy to report on, they, in and of themselves, are hard to impact. At the same time, she suggested that leading indicators are different. Although they are much more useful to help us impact performance, they are harder to measure and tend to change over time. If you take a look at the most commonly referenced KPIs they are not only relatively easy to measure, they are generalizable, or relevant across a wide group of companies and industries. Unfortunately, leading indicators are not as easy to measure, and the ones you want to measure tend to be unique to you. As such, you don’t see them in as many blogs. For one thing, other people will not typically agree upon the “magic ones” for good reasons. Their value is derived from the fact that they are aligned with how you run your business and execute on your strategies or address your challenges. There are exceptions of course. Take NPS, a topic that I have a very strong opinion on (more in line with a book than a blog) but for now, let’s not go there. For this blog, let’s just look at some of the strengths of NPS. One of these strengths is that it is promoted by many as a leading indicator of organic growth. Secondly, NPS is generalizable. Virtually any company can ask the “ultimate question” about their business. Even Bain & Company states: “Net Promoter merely measures the quality of a company’s relationships with its current customers, and high-quality relationships are a necessary, but insufficient, condition for profitable organic growth.” So what are the necessary and sufficient conditions for profitable growth? Of course, they include things like product market fit, minimally viable products etc. But, they also include the ability to engage with customers in ways that support their success. This ultimately includes the processes and knowledge that are used to help your customers succeed; this is where process performance metrics come into play. To understand these, let’s take a look at the example of the logical decomposition of metrics from lagging, to leading, to process performance. The following graphic is designed to help in that regard. It’s just a framework, since things like pricing changes are not represented, but factors that affect tailwind (or headwind if you are actually lowering your pricing – ouch) are! Let’s start by assuming that in that chart above, we have a good net churn number – a negative one. Rather than use a negative (which is good) net churn (one vote for the negative net churn skeptics), we’ll use a derivative of net churn, net revenue retention, because I like the intuitive, “we grew or shrank” view of the world! Note: Net revenue retention rate for a period = [[Start of period MRR + MRR from up-sell + MRR from price increases] – [MRR from churn + MRR from price decreases]] / [Start of period MRR]. Let’s assume this number is 105% (growth), so at first glance, everything is pretty good, right? Well, that conclusion actually depends on your headwind versus your tailwind. Let’s assume that your headwind (downgrades and churned customers) is actually about 20%. When you look at the numbers this way, your investors think you have a problem, which to us of course is really just a great opportunity. In a way, everything is going according to plan, we have our metrics, and we can see a problem…the only real question is: What’s next? Ideally, what we want is some sort of measurement that is correlated to those customers that churn, a behavior that we can monitor so that we can get in front of those customers, understand what is going wrong and save the day (Ideally, before it needs saving). That is what a leading indicator/metric is. In CS, we hear a ton about the ultimate leading indicator, which is the health score. Unfortunately, the term is often an oversimplification of something quite complex. In reality, it is an amalgamation of everything from “should we have sold to this customer?” (FIT) to NPS or Usage, which are just a few of the components of a useful health score. Since we are giving examples here, rather than an exhaustive list, let’s just look at usage Trust me, it’s complicated enough. As for the example, let me share one I gathered while listening to a talk by the SVP of a publicly traded SaaS company (> $2B market cap). He commented that from a retention perspective, people storing files (usage type 1) is a good thing. But, he also said that when multiple users access the same file (usage type 2), their stickiness (my words, not his) is much better. As such, assuming they’ve done some sort of correlation between their churning customers and usage type 2, they have a great leading indicator. As much as this may be a really great example, as far as your business is concerned, this measurement may be (and probably is) totally meaningless. This is a reflection of the fact, stated earlier, that leading indicators tend to be more unique (vs. generalizable). Is this bad news? I don’t think so. This is what makes the job of a CS team great, and your company and customers unique. Figuring out your leading indicators (which change over time) is a critical part of how you add value as a team. Assuming you’ve already done this, or are up to the challenge, there is one more step. That step takes us to process performance metrics. To continue with our example, even when we know that multiple people accessing the same file is a great leading indicator of long term health and reduced churn, we have more to do. Our job includes figuring out how we are going to impact/increase/improve that leading indicator. Once again, referring to the diagram above, there are a number of ways in which we could impact this leading metric. We could put a process in place to stress the value and simplicity of file sharing and collaboration during onboarding. This would be a process change. We would need to measure how many customers got the new training, and if their adoption of this capability is better than before the onboarding was changed. Basically, we can measure the process we put in place to drive our leading indicator. Another example could be to run an A/B campaign to inform existing customers, one in app and the other via email. We could then understand which process (method) is effective (or if either of them are). The key here is to try to establish some correlation. Ideally, this would be cause and effect, but having done this for years, this is often really hard to do. Establishing cause and effect is always tough, and is extremely challenging because in the real world, you usually take a multi pronged approach. That doesn’t mean, however, that you just wing it. At a very minimum, you must measure if you are doing what you said you were going to do. If you are going to try to reach your customers with a campaign, you need to know you’ve reached 37% and establish if your approach has impacted your leading indicators/metrics. Then, for those who weren’t reached by this method, you can systematically reach out to them by employing another approach and process (which should be measured as well). This all sounds like a bunch of work, and of course, you could just play whack a mole, hoping to get lucky. If, on the other hand, you prefer to be great, consider how the information shared here can be used to drive your company to even greater heights. Remember, this isn’t just the sort of thing big companies do; this is what little companies do to become big companies.